Edmund Tudor was the father of King Henry VII, founder of the Tudor dynasty. Edmund was born in 1430 to Catherine of Valois and Owen Tudor. Catherine was the widow of King Henry V and mother of King Henry VI, while Owen Tudor was the keeper of Catherine’s wardrobe. It is likely that Edmund was the couple’s second son, the first, Owen, having been born out of wedlock, was left to the church and became a monk in Westminster Abbey. Edmund’s mother died shortly after giving birth to a daughter on 3rd January 1437. Edmund’s father was arrested shortly afterwards and imprisoned for marrying without the King’s permission. Edmund and his younger brother, Jasper, were brought up by Katherine de la Pole, abbess of Barking and sister of the Duke of Suffolk. They remained in the care of the abbess until 1442 when Henry VI took charge of his two half brothers. 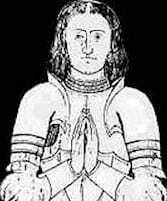 Edmund was created Earl of Richmond on 15th December 1449 and given land and property. He was knighted in 1453 and had become one of the King’s advisers. On 24th March 1453 King Henry VI made young Margaret Beaufort, heiress to the Beaufort fortune, a ward of both Edmund and his brother Jasper. 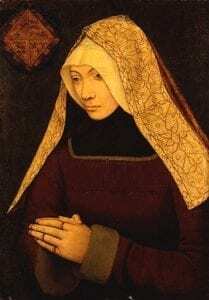 On 1st November 1455 Edmund married his ward, Margaret Beaufort. She was aged twelve at the time of her marriage while Edmund was twenty-five. Edmund shocked his contemporaries by consummating the marriage. Although many marriages took place while the girls were children it was usual to wait until the girl was fourteen or fifteen before consummation took place. It is likely that Edmund did not want to risk losing access to Margaret’s fortune. Margaret became pregnant early the following year. In the summer of 1453 Henry VI suffered a bout of mental instability and was unfit to rule the country. The Duke of Somerset took over control of the country but his rule was not popular and the nobility, including Edmund and Jasper Tudor, voted Richard Duke of York as Protector. Henry VI regained his mental faculty the following year and reappointed Somerset. This led to Richard of York raising forces against the King. Edmund and Jasper decided to remain loyal to the King. Edmund was dispatched to Wales in the Summer of 1456 to put down an uprising by Gryffydd ap Nicholas. He succeeded in his mission but was then captured by the forces of Richard Duke of York and imprisoned. While in prison he contracted bubonic plague and died on 3rd November 1456. His posthumous son, Henry Tudor was born on 28th January 1457.